Thurs., Nov. 29, 2018, 7 p.m.
UW-Green Bay, Marinette Campus student Jordan Miller can speak from experience. She has been living most of her life with Type 1 Diabetes. 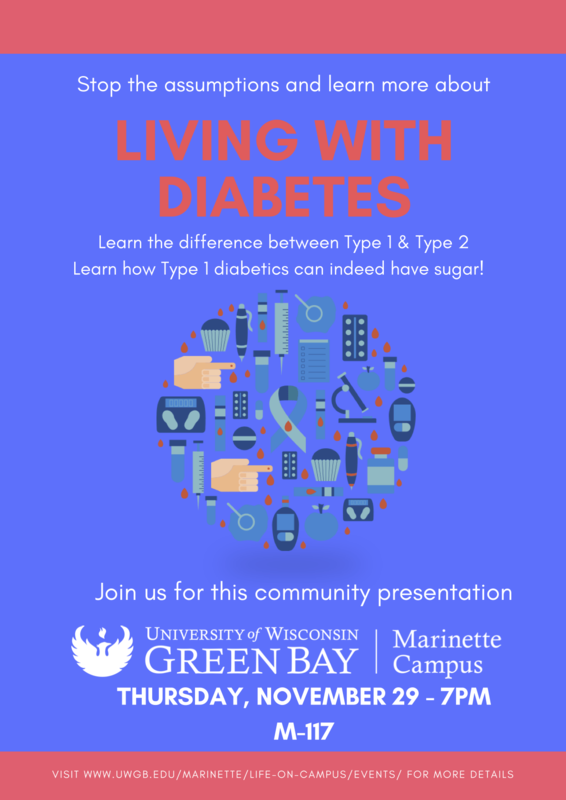 Miller, along with Diabetic Educator, Nola Hardy (Aurora Health Care), and UW-Green Bay employee Aubrey Schramm, and her daughter Ciri, will present “Living with Diabetes.” The community presentation will be Thursday, Nov. 29 at 7 p.m. Room M-117, on the Marinette Campus. It is free and open to the public. The presentation will engage attendees about assumptions and misconceptions while they learn about the differences between Type 1 and Type 2 Diabetes. Watch this video featuring Miller, and the breakthroughs that have allowed her, and her family members, to live with Diabetes.